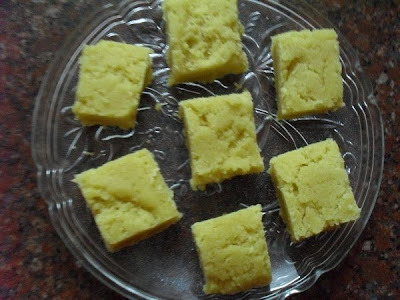 Mysorepak Version 2 - Bengalgram flour fudge. Dibs is an enthusiastic follower of Vah Chef. She wanted to make a sweet all by herself for a function celebrated at home during her stay here. We also needed to make a pair of 'Paruppu Tengai' -( any sweet moulded into two cones) - for pooja purpose. 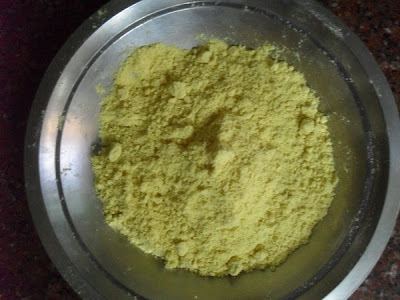 Dibs decided to make MYSOREPAK Vah Chef style, which could also be used for making the ' Paruppu Tengai'. On the eve of the function a huge kadai and a pair of ' Paruppu Tengai' moulds were brought down from the attic . We finished cooking dinner and cleaned up the kitchen making space for Dibs' wild adventure. 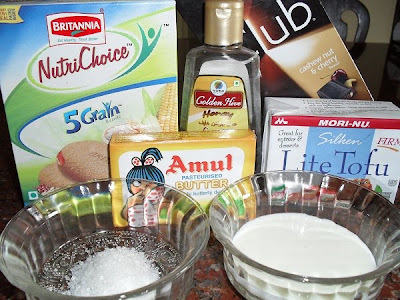 One kg of besan ( roughly 4 tall glasses could hold it), 10 glasses of sugar , 2 glasses of oil and 2 glsses of ghee were assembeled. I thought it would be wise to back out of this (mis) adventure at least at this juncture! The quantity of the ingredients seemed overwhelming. But nothing could stop Dibs' enthusiasm. 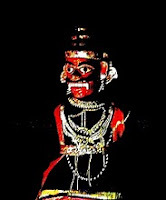 She had already made her aunt grease a huge 'tambalam' ( a huge deep plate ) and the metal cones which were inverted and held in place by two long and narrow mouthed vessels. Dibs, her aunt and I took turns to stir the monsterous bubbling sweet 'lava' continuously while the other members of the family peeked in with amazement amidst their other chores. Two hours, three people and a marathon effort ! Hurray ! The MYSOREPAK was ready ! Two of us lifted the kadai to pour the stuff into the cones while my sister-in-law used the long spatula to scoop out the quickly hardening sweet. Once the cones were full the rest of the sweet was quickly spread out on the greased tambalam. Dibs heaved a sigh of relief while the rest of the family cheered joyfully ! Every one craved for more when the soap bar size Mysorepak just melted away in their mouths! 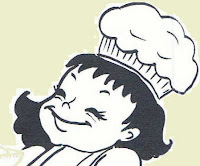 Three cheers to Dibs and three cheers to Vah Chef ! It is a pity that the whole process could not be photographed in the middle of all the hullabaloo. 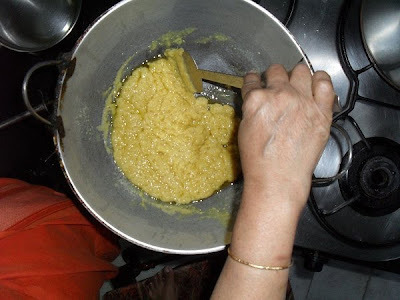 Here I have tried to follow the same method to prepare Mysorepak using 1 cup of besan, 2 1/2 cups of sugar, 1/2 a cup of oil and 1/2 a cup of ghee. My grand daughter eagerly captured the cooking moments standing up on a chair beside . 1. Heat 2 cups of oil and rub into the besan well and, break up all the the lumps. 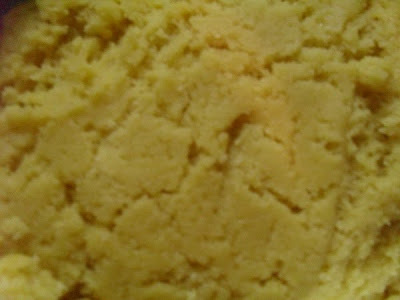 Sieve it to get a smooth texture. 2. Heat sugar and 5 glasses of water in a wide and thick bottomed kadai. 3. 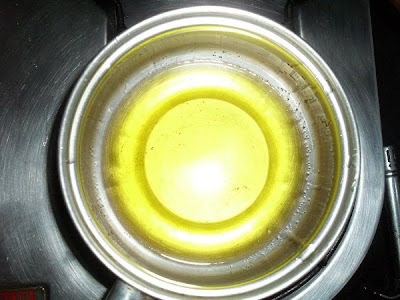 Heat oil and ghee together in low flame in another kadai on the second burner of the stove. 4. 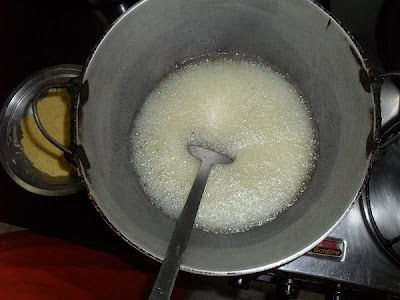 When the syrup is of one thread consistency start adding the besan little by little stirring it all the time in one direction. 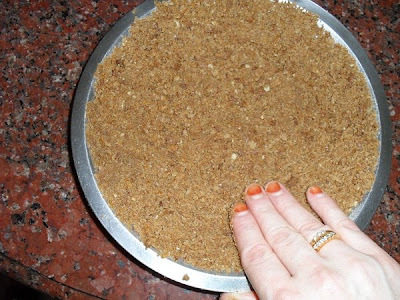 It is better if a second person does this while you keep stirring, when preparing a large quantity. 5. 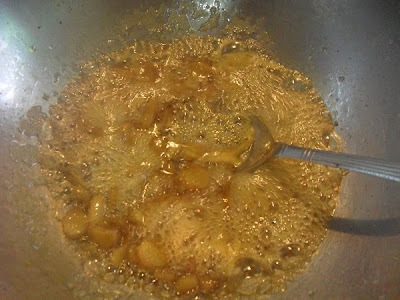 As the syrup and flour blend starts thickening increase heat of ghee and oil on the second burner. 6. 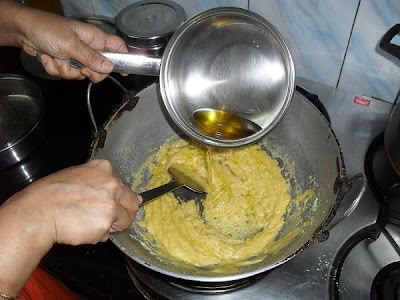 Keep stirring and keep adding hot ghee & oil little by little, using a ladle and notice the syrup and besan blend getting fried. 7. 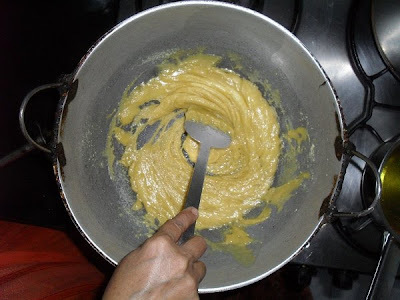 When the mixture starts looking scrambled or curdled, and when dark brown patches of colour start to appear, pour out the mixture on a greased plate . 8. The MYSOREPAK sets in no time . Mark with a sharp knife immediately. CUT OUT THE BARS WHILE STILL WARM AND ENJOY AS THE MYSOREPAK MELTS INTO YOUR VERY BEING! This mouth watering curry was prepared by my son when we returned hungry and tired after a hectic outing while my daughter-in-law rolled out hot and puffy pulkhas. 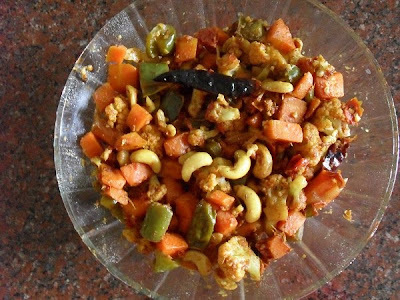 I prepared the same yesterday with one spoon less of sambar powder and one spoon less of salt . My grand daughter who loves cauliflower enjoyed it to the core. Heat the oil in a big kadai. Add in the jeera, methi, pepper and red chillies. Once the jeera pops add in the green chillies, onion, ginger paste and garlic paste. Saute until the onions become transparent. Stir, cover and let the tomatoes cook down. 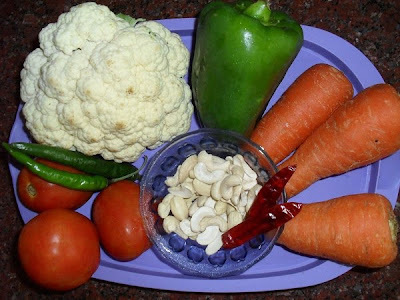 When the tomatoes have broken apart add in the rest of the veggies and cashews. Cook covered until all the veggies are ' al dente' or almost done. To prevent burning add in a little water if necessary. 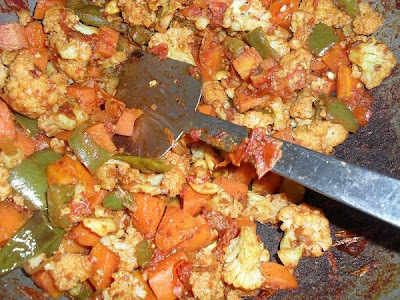 When the veggies are almost done, remove the lid, add in the masala podi and cook until the veggies are nice and tender. We had a great family get together for nearly a month and a half when all our children had come down like a whiff of fresh air. The over burdened dining table looked like a perfect wishing table with all their childhood favourites.The table now looks relieved with a spread of two or at the most three dishes on it. The jokes cut at our (parents) expense followed by the hearty laughter and chatter, the babbling of the babies and children and the merriment have all gone back with them. Now we are back to square one, just the two of us lost in reverie in our now empty nest. My children not only relished 'amma's' food but also came forward to prepare their own exotic dishes for all of us. We are a family of ardent chocolate lovers. 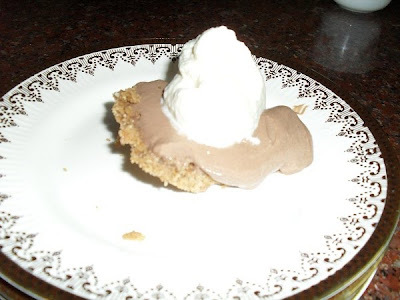 The Chocolate Cream Pie prepared by my daughter-in-law was a great hit and she had to prepare more of this delightful dessert the very next day due to the persistant requests of the connoisseurs! 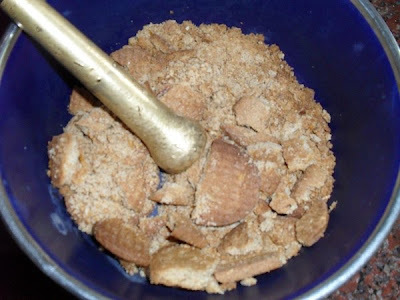 Crush the crackers in a bowl until they are a fine powder. 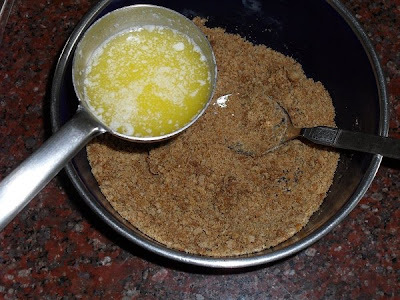 Drizzle in the melted butter and stir until all the bread crumbs have absorbed the butter. Pour the mixture into an pie dish and press out to an even thickness on the bottom and all the way up the sides. Set aside, in the fridge if you are in a warm place. In the mean time, slit open the tofu box and squeeze out the excess water. Let it sit so it can continue to drain while you temper the chocolate. For the chocolate, use the doubble boiler method. I did not have an official doubble boiler so I improvised with a smaller dish, holding with the kitchen tongs and stirring to temper the chocolate. 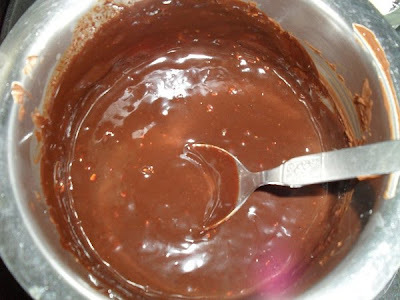 An option while tempering the chocolate is to add extra cocoa powder, sugar and milk to get a “chocolatier” end result. 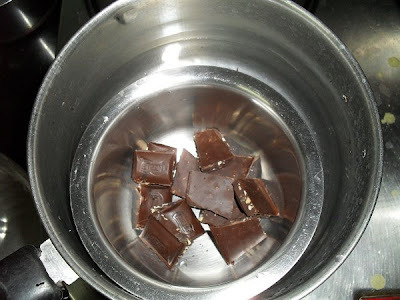 Once the chocolate is tempered remove from the double boiler and put into a bender. 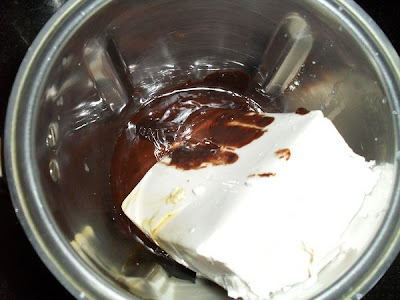 Add the tofu, sugar, honey and vanilla to the blender with the chocolate. Blend until smooth (15 seconds or so). 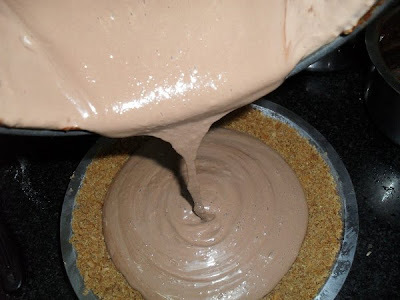 Pour the mixture into the pie shell, return to the refrigerator. Let the pie sit and firm for about 2 hours before serving. While the pie is chilling make the whipped cream. For best results use a VERY large metal bowl and large whisk that are ice cold. I store mine in the freezer for 30 min before making the whipped cream. 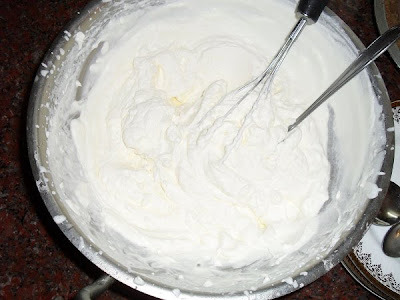 Pour the cream into the cold bowl and whip with the whisk to add bubble. After a few whips add in the sugar, whip again and then add in the vanilla. Continue whipping until the cream forms stiff peaks. 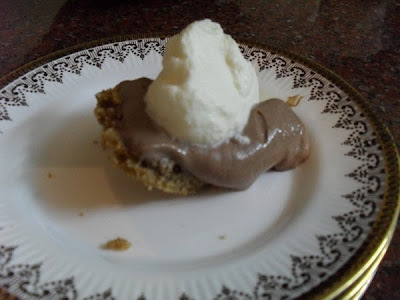 Top the pie slices with whipped cream when you are ready to serve. 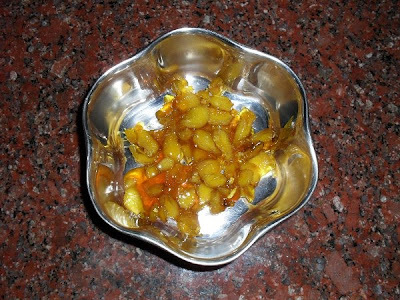 Inji Murabba is pickled ginger and it can be savoured before a feast as an appetizer or relished as a digestive after a feast. It is very good to have it handy during the Deepavali festival which is great benging time with so many sweets and savouries being prepared and exchanged among friends and relatives. 1. 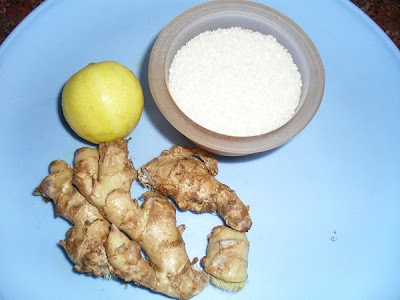 Cook the peeled and sliced ginger in 1 1/2 cups of water and salt till it becomes tender. 2. Add sugar and cook till the syrup reaches one thread consistency. 3. Add turmeric powder, stir well and cook for one more minute. 4. Switch off flame and add the lime juice. 5. Stir well and store in a bottle when thoroughly cooled. Enjoy the spicy hot sting of the ginger along with the lemony sweet sugar syrup and feel the attack of hunger pangs in your tummy soon after!